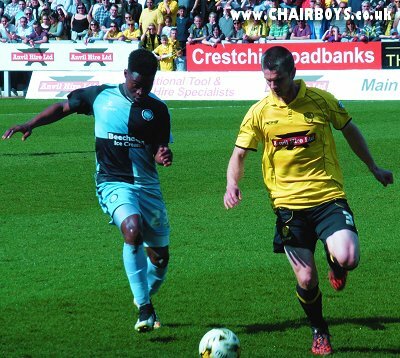 Wanderers were inflicted a successive defeat for only the second time during the 2014/15 campaign as they went down 1-0 at leaders Burton Albion on Easter Monday. The narrow defeat, in partly controversial circumstances, was hugely softened by 4th placed Bury's shock 2-1 home defeat to Morecambe and means that Gareth Ainsworth's side remain four points clear of The Shakers, although they have a game in hand. The defeat at Burton came after Wycombe made one change to the side that had lost to Oxford three days previous - Aaron Holloway coming in to replace an injured Sam Saunders. It was the home side who had the better of the early exchanges - former Wanderer Stuart Beavon blasting wide on 16 minutes before he was booked a few minutes later for a late challenge on Aaron Pierre. Sam Wood shot wide for Wanderers on 25 minutes but an incident a minute later proved to be an overdebated point in the aftermath of the result. A long clearance from Matt Ingram was misjudged by home 'keeper Jon McLaughlin as the ball bounced up close to the edge of the penalty area. The assistant referee on the nearside spotted the McLaughlin had caught the ball outside the area and signalled the infringment. 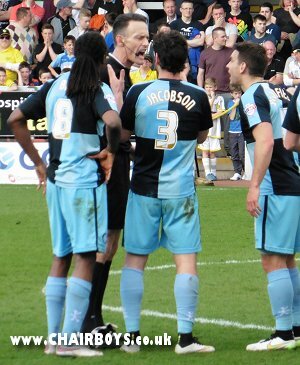 With the Wycombe contingent baying for blood, referee Darren Deadman showed the Albion 'keeper a yellow card for deliberate handball - opting not to show a red because it wasn't 'denying an obvious goalscoring opportunity' - a Burton defender clearly ahead of Fred Onyedinma's chase to what would have been a loose ball running to the right of the goal. Whatever the outcome, it prompted Wycombe's best spell of the half, with Onyedinma going closest on the stroke of half-time when he saw a shot blocked from close range at the right-hand upright. However, Burton responded after the break and grabbed the crucial goal on 56 minutes when an unfortunate slip by Joe Jacobson on the watered surfaced let in Adam McGurk to bend in a shot from the right of goal from around 20 yards. Burton were now in the ascendency and with nine minutes of normal time remaining the skilful Nasser El Khayati was allowed to cut in from the left before striking the near post from a narrow angle - substitute Matty Palmer blazing the rebound wide in front of sizeable travelling support. Urged on by that support, Wycombe then threw all they had at the home side for the dying minutes. Onyedinma saw a low shot saved by McLaughlin on 82 minutes but the closest to an equaliser came in the 89th minute when Pierre thundered in a header from a corner that McLaughlin somehow managed to save low down and deny what looked a certain goal. Understandably it was a frustrating day for Wycombe but hearing that Bury had also lost gives Gareth Ainsworth's side the opportunity to keep Wanderers' promotion fate in their own hands with five crucial games remaining - starting at home to bottom club Cheltenham Town on Saturday (11th April). Burton: McLaughlin, Edwards, Cansdell-Sherriff, Mousinho, Taft, McGurk, Stewart, Naylor, McCrory (sub HT Palmer), Beavon (sub 80 Weir), El Khayati (sub 90 Slade) - subs not used: Shearer, Harness, Maynard, Johnstone. Commenting after the game, Gareth Ainsworth said, "I thought we were fantastic. The fans were brilliant. I want to thank them and if I could thank everyone I would because they never stopped singing. I'm really pleased. If we play like that for the five games remaining we'll win all five. There were many incidents in the game that I thought were questionable and I thought we were denied maybe three points today. That's hard to swallow but we swallow it. We're all friends, all the managers. It's horrible that people have to lose. I just want to win this by performing in these last 5 games." When questioned further on the controversial incident in the 26th minute, Ainsworth added: “The referee has said it didn’t look like a goal scoring opportunity so I have absolutely no idea what constitutes a goal scoring opportunity if that is not one. The ball looks like it’s going in the net and we had two players, if the ‘keeper leaves it, who get to the ball first and slot it home. I have no idea why he hasn’t given that and only Darren Deadman will know why he hasn’t given that. If our promotion hopes come down to that then it will be a terrible miscarriage of justice. The referees have a tough job and I’m not about to get myself in trouble, but in my opinion Darren Deadman got that one wrong."